Let us help you locate detailed information about your examination program! To find a candidate handbook, testing locations, fees and scheduling information, make a selection in each category below. Most programs offer a candidate handbook with information including eligibility to test, examination content, and testing fees. This link will take you to the examination selection page where you can locate the candidate handbook for your program. We recommend you read and understand the information provided in the handbook prior to scheduling your examination. AMP complies with the Americans with Disabilities Act and ensures that no disabled individual is deprived of the opportunity to take an examination solely by reason of that disability. Special examination arrangements may be made for individuals on a case-by-case basis. If you require special accommodations, complete the Request for Special Examination Accommodations form included in your handbook and submit it a minimum of 45 days prior to your anticipated examination date. The information you provide and any documentation regarding your disability and your need for accommodations will be treated with strict confidentiality. You may reschedule your examination appointment online (by following the three steps above) or by calling our Candidate Support Center. Your appointment cannot be rescheduled by email. Refer to your Candidate Handbook for specific rescheduling guidelines. 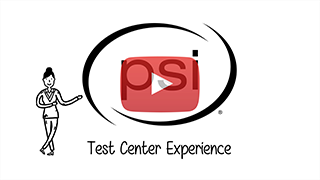 Watch this video for an introduction to the test center. It will walk you through a typical testing experience, but please reference your candidate handbook for requirements specific to your program. Prepare in advance. Use study guides and other reference materials to prepare for your examination. Be sure you read and understand the candidate handbook for your examination program. Get plenty of sleep the night before your examination. Make sure you have eaten before the administration begins, you will not be allowed food or drink in the testing room. You will be allowed restroom breaks, but you will not be given additional time for time lost during breaks. Two current forms of identification are required, one government issued with photograph and both must have your name and signature. If a calculator is allowed for the examination, make sure your calculator complies with the calculator requirements and is in working order. Make sure you know where your testing center is located. Be sure to allow extra time for traffic, parking and getting settled before the examination. Dress in layers so you can adapt to any room temperature. Heavy coats and hats are not allowed in the testing room. No personal belongings, including cell phones, smart phones or other electronic devices are allowed in the testing room. You will be asked to return them to your car or turn them to the off position and place them in a soft-locker provided by the site. If your electronic device rings, vibrates or makes any noise during the examination, you will be dismissed from testing and no refund will be provided. Depending on your program, you may be provided a pass/fail score report after your test. Otherwise you will receive instructions indicating when you can expect to receive a score report. Additional instructions for after testing may be available in the candidate handbook. © Copyright PSI Services - All Rights Reserved.